Kuzuko Lodge, a South African malaria-free safari lodge in Eastern Cape, is nestled in the cavernous bushveld of the Addo Elephant National Park in the Sundays River region. 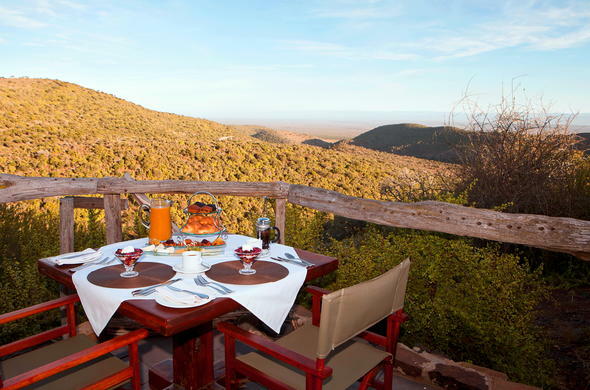 Kuzuko Lodge is ideally situated in a private section of the scenic Addo Elephant National Park. This safari lodge in the Eastern Cape offers guests a luxurious malaria-free safari experience. Enjoy the views across the valley from your own private deck area. Each chalet is fully air-conditioned and fitted with en-suite bathrooms with a separate bath and shower. Relax in your private lounge after an exciting day's game viewing or cool off in the refreshing swimming pool. The Wellness Centre offers a range of relaxing treatments to indulge in. Track African wildlife while staying at this Eastern Cape safari lodge. Begin your day with an exciting game drive where you might see Elephant, Buffalo and Rhino. Lion is most frequently spotted during night game drives. The Addo Elephant National Park is also home to wide range of diverse bird species.